Low budget US indie horror-thriller that takes place online as viewed through the laptop of one of the characters. 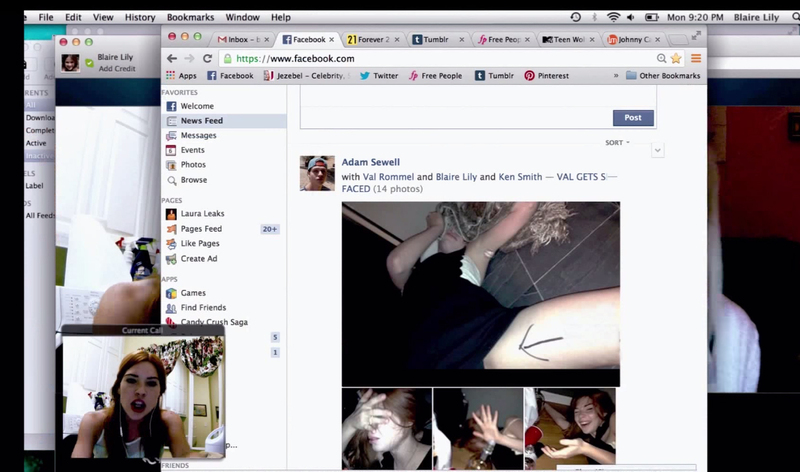 From the get-go, you know you’re viewing something different with Unfriended. Although it only cost $1m to produce, the story is original and – up to a point – well-crafted. From the posters and the trailer it may seem like another teen scary movie, but once it starts, it feels like something else .. something new. The entire film takes place on a laptop screen, viewed by the audience as if they’re looking through the eyes of the female leader, Blaire Lily, a 17 or 18 year old student who’s happily Skyping with her boyfriend one minute, only to be rudely interrupted by a group of their friends the next. you’re there, slap bang in the middle of the group trying to work out what the hell is going on. The plot revolves around the subject of cyber-bullying and the devastating effect trolls can have on individual’s lives and yet it’s in no way a typically preachy American morality tale. This is an out-and-out horror movie, albeit one more reliant on suspense and tension that blood and gore. … and that is all I can say about what actually happens, really, without giving away spoilers. I can tell you that there’s some well-rounded characterisation with detailed back stories revealed as the film progresses, including plenty of juicy secrets that the various members of the gang have been keeping from each other. The third party knows and it also knows what to reveal and when .. Together, they play a game – all online, all on-screen – and nobody is allowed to quit. That’s punishable by .. well, you’ll have to watch the movie to find out. The ending left a little to be desired and could’ve been done differently. The outcome is fine and fits well with the rest of the story, but it’s just the execution that was a bit too quick for me. .. and when I say execution, it’s not that kind of execution. I told you: no spoilers ! One word of warning : if you’re not a very tech-savvy person you will hate this picture. 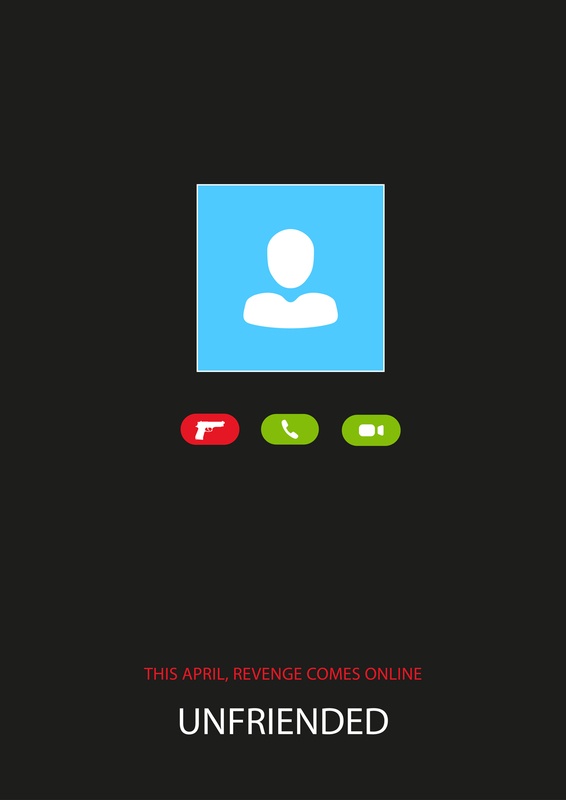 The very nature of Unfriended from the title to the format of the film is all based on modern communication : Facebook, instant messaging, mobile phones, Skype, YouTube, etc. There’s actually some really nice touches throughout, such as the way the lead character types her messages, pauses before clicking send, erases a bit, then the whole thing, starts over, and so on .. it’s exactly like real people would use a computer, even down to the way the cursor moves around the screen. Whether someone who still uses UPPER CASE WHEN THEY TEXT would enjoy this kind of thing is doubtful so just be aware of what you’re letting yourself in for : it’s an intense, sometimes very hectic experience, sitting through Unfriended. If you like horror, it’s worth it .. This entry was posted in Uncategorized and tagged cinema, film review, horror, movie review, review, teen movie, thriller, unfriended by rigger67. Bookmark the permalink.